Smashwords has released a new tool for authors and publishers that supports custom library pricing and simplified pricing management across titles. The Pricing Manager feature is accessible from the Smashwords Dashboard. It allows authors and publishers to view and manage pricing for up to 50 titles per screen. 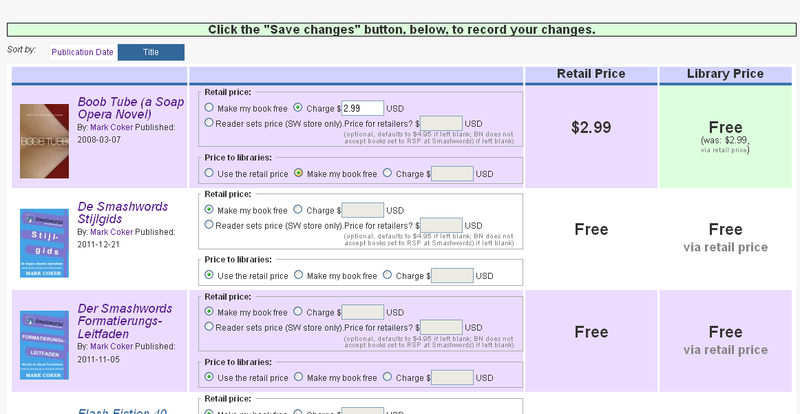 At-a-glance, authors and publishers can view retail pricing and library pricing side-by-side. The Pricing Manager, and its support of custom library pricing, is a foundational element of our long term library distribution plans. I'm excited about the opportunity to help introduce patrons of the world's libraries to the world's largest catalog of indie ebooks published by over 45,000 Smashwords authors and publishers around the world. I expect the new tool will enable library-friendly pricing that will dramatically increase worldwide library sales for our authors and publishers over the next few years. When library patrons go to their library to discover their next great read, if your book isn't there, they'll discover some other author. According to data published by Library Journal's Patron Profiles service, in conjunction with Bowker, 50% of all library users go on to purchase books by authors they first discovered at the library. At a time when big New York publishers are turning their backs on libraries for fear library ebooks will cannibalize retail sales, we're embracing libraries. We believe that libraries will not only spur discovery of our authors' books, but we also believe they'll help our authors reach more readers, build platforms faster, and sell more books at our retail partners. Based on my recent survey of 150 Smashwords authors and publishers, our community agrees. 82% of Smashwords authors and publishers told us they believe libraries will help them sell more books overall. 12% were unsure, and 4.7% thought libraries would harm their overall sales (the data doesn't add up to 100% due to a few non-responsive answers). 24% of our authors and publishers told us they wanted to donate their books for free to any library that wanted them. The reason? They believe recognize the platform-building power of libraries. 32% said they wanted to provide their books to libraries at lower prices than they sell their books through retailers. Our new library pricing option will allow authors and publishers to control library pricing. I think this control will give indie authors a strategic advantage over traditionally published authors whose books are handcuffed by the library-unfriendly policies of the large publishers. The ultra-competitive pricing will also allow libraries to stretch their limited budgets while at the same time enabling them to acquire large collections of indie ebooks. Earlier this year, Smashwords began distributing to libraries via library aggregators. Baker & Taylor's Axis360 was the first aggregator to begin distributing our books to libraries, and we have since signed a relationship with 3M's Cloud Library service. We expect to announce additional library aggregator partnerships in the future. These library aggregators sell our books to libraries, and then host and manage the checkout systems for libraries. Previously, the library aggregators sold our books to libraries at the same price the books are sold at retailers. Starting in the next couple weeks, the new library pricing will flow through to our library aggregator partners. Concurrent with the new Pricing Manager, this week we also launched a new distribution channel option called Library Direct. Library Direct allows libraries and library networks to acquire and establish large opening collections of Smashwords ebooks. 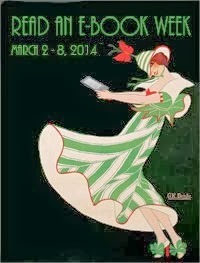 The option is available to libraries that host and manage their own ebook checkout systems, typically using Adobe Content Server. We have already received purchase commitments from three libraries, each of which will acquire some variation of our top 10,000 best-selling titles. Click here to read my companion announcement about Library Direct. I'm wondering what percentage a library usually pays for a print copy of a book, so I can judge how to price my book for them. Do they pay more? Less? Thank you, Mark and Team, for the added pricing flexibility and increased access to libraries. How are "free" titles being distributed via the LibraryDirect program? Similarly, how will lowering our prices, via Pricing Manager, drive titles to libraries? I strongly believe authors should donate to libraries for the common good. I will price my ebooks at "free" also to libraries to grow my base. Having made this commitment, however, doesn't seem to mean that my titles will get to library patrons any differently than what occurs within a library's legacy process. For example, whether via LibraryDirect or aggragators, the distribution model is still a "pull" strategy - where libraries cherry pick titles, catagories, and/or best-seller lists. This is a departure from Smashwords' base model, which "pushes" the entire Smashwords catalog to retailers. As such, what does it matter what I price my ebooks at if my titles aren't selected by libraries and aggregators! What is the process for distributing "free" ebooks to libraries via Smashwords? My concern is for those of us who don't have titles in the Top 100 (or whatever). The sorting and selection criteria, from what I've read, allows libraries & aggregators to cull from pre-defined sorts. Is "free" one of them? 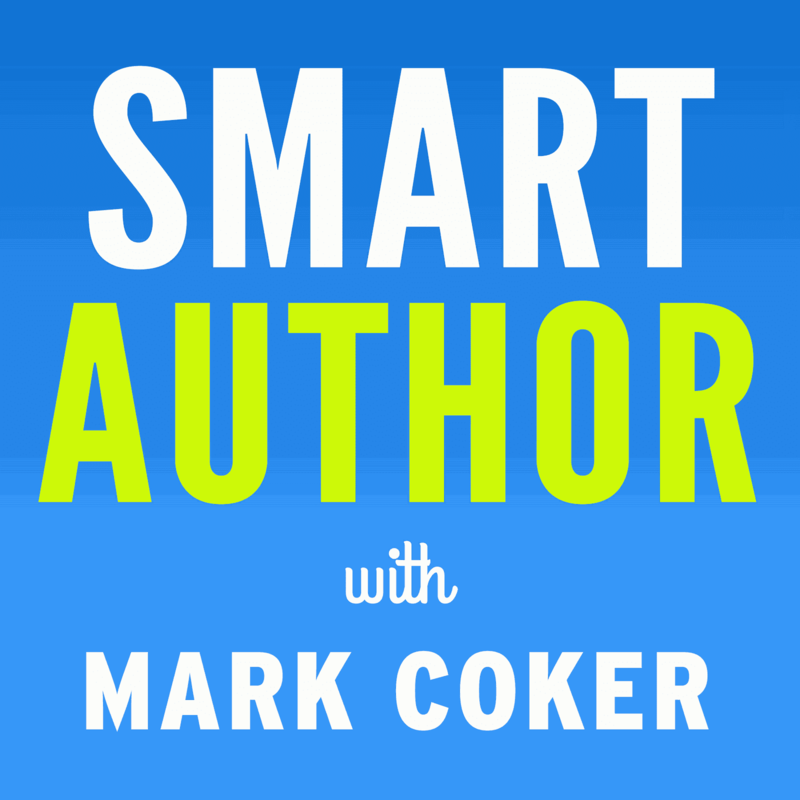 What does less-than-retail pricing (the library-pricing field) do for authors/publishers? It's a no-brainer for libraries to accept free books as they don't impact a library's budget. As such, unless there's a prestige factor at play, libraries should gobble up the free titles. You see the problem here - my titles may never reach library patrons unless pushed to libraries. I eagerly await clarification from the Smashwords team. I made a blog post for my readers about this. Some of my readers tell me they can't afford to buy books given the economic environment (which I understand). I see this as a great solution for me as the author and for the reader who is strapped for cash. I have asked my readers who have library accounts where they borrow ebooks to ask their local libraries to look into getting my ebooks. If the customer requests the author's books, I think libraries would be more likely to look into getting them. If the books are free for them to obtain, I think libraries are even more likely to get those books. So I think by making the book free to libraries and having our fans ask for the books, we increase our chances of getting our books into libraries. I certainly agree with your perspective, Ruth. Successful and branded authors will enjoy the benefits of participating in LibraryDirect and the library-pricing tool within Smashwords, but what about the majority of Smashwords' 45,000 authors, who remain virtually unknown? The beauty of Smashwords is that it provides a level playing field for both successful and unknown authors. So, my questions target Smashwords' processes and its relationships with aggregators and libraries: How will Smashwords retain its neutrality with an offering like LibraryDirect? How will free and under-priced ebooks get to libraries and their patrons?